What happens when two writers from different genres come together to talk about science fiction, fantasy, and story crafting? You’re about to find out! Rachel Bach grew up wanting to be an author and a super villain. Unfortunately, super villainy proved surprisingly difficult to break into, so she stuck to writing and everything worked out great. Her current project, the Paradox series, is a high-octane SF adventure across many fascinating alien worlds. 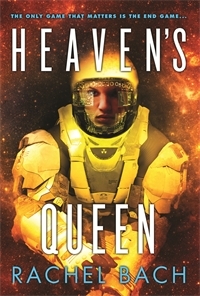 Look for the third novel, HEAVEN’S QUEEN (US | UK | AUS), online and in stores on April 22nd or start at the beginning with FORTUNE’S PAWN. Elizabeth Moon has degrees in history and biology, and served as a commissioned officer in the U.S. Marine Corps. 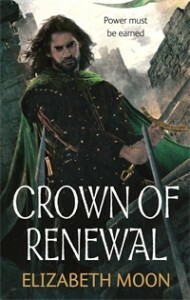 CROWN OF RENEWAL (UK | AUS) is the final installment of her Paladin’s Legacy series. This gripping epic should be on every fantasy reader’s To Read List. Expect it to be hitting bookshelves on May 27th. Elizabeth: You’re well known as someone who can write very fast without loss of quality, and your recommendations for increasing speed–both in your blog and in your book–make good sense. (In fact, I’d been using only two legs of your “triangle” for years and after adding the third had such good days with a new story that it slowed me down in getting these questions ready.) I’ve had 10K word days in the past, but I’ve also experienced increasing physical difficulty–arthritis in my hands, neck, and back that limited how much I could write in a day. Have you considered expanding your advice to include the ergonomic issues arising from very fast writing? How to generalize the skills to using alternate input methods, such as using a speech input? (I’m waiting for the direct brain-to-page technology. Visualize the scene: boom, it’s in the file or on the page, ready for editing. Hear the conversation between characters: there it is, with all the uh, um, er…but nothing vital missed. Rachel: I can’t tell you how thrilled I am to hear my writing triangle helped you have a good writing day! Best thing ever. I’m not at all surprised to hear you’d already figured parts of the triangle out. I’ve heard the same thing from several experienced authors, and I’m starting to think that all I did here was put words to what’s actually a universal writing concept. Can’t stop the signal, Mal! You’re also not the first person to mention the physical difficulty of writing ten thousand words a day. The most extreme example of this was when I did my an annual open Q&A on the NaNoWriMo forums. One of the writers I talked to had stared out as a professional musician, but she had to stop when she injured her hands through repeated stress caused by playing. This injury effected her writing as well. She wasn’t even able to type two thousand words a day before her hands gave out, much less ten. It’s an admittedly extreme example, but it highlights the fact that writing is much more of a physical activity than most people give it credit for, especially if you have a pre-existing injury or ailment, like arthritis. So, yes, I think this is a very valid point and I will be updating my book and blog to include it. Even with my healthy hands, it is physically exhausting to type that much, and it would be very easy to seriously injure yourself if you’re not careful. That said, though, I don’t actually know what to recommend as a solution. Right now my best advice is to listen to your body and stop if something hurts. Likewise, you should pay attention to your writing position and invest in a keyboard that’s comfortable for your hands over long periords. Speech to text programs have also come a long way in recent history (prolific author Lynn Viehl swears by Dragon Speaking Naturally), but I’ve never personally used them as anything other than a novelty. Anyway, long story short, you make a very good point and I will be definitely be amending my process to include this issue. After all, my hands might be good now, but I intend to be in this writing business for as long as I can, and at ten thousand words a day, I’ve got a lot of typing in my future. When can we expect that brain to page interface, science? Rachel: Actually, I think all of these questions interrelate beautifully! Like a lot of writers, I already knew what I wanted to be when I went to college, and English Major seemed like the most logical choice. How better to learn about writing books than by studying how the best are put together? The reality of my experience was very different. This is not to disparage the University of Georgia’s English program, which is actually very good, it just wasn’t what I wanted it to be. College English programs are excellent at teaching you how to be a good non-fiction writer: how to properly use sources and make solid arguments and write thoughtful essays. But fiction writing is a different beast all together, and even though I took several creative writing classes, they were all focused on literary short story writing, which is about as far from genre novels as it’s possible to get and still be called fiction. Even worse, I was in an environment that actively looked down on the sort of commercial books I enjoyed and wanted to write. So yeah, not a good choice for me in hind sight. If I had it to do over again, I would have majored in something much broader, like history or sociology, or even Comparative Lit, which focuses on international fiction instead of the Western Euro-centric literary cannon. I would also have taken a lot more electives, because the most useful thing I’ve found as a novelist is having as wide and diverse a base of knowledge and interests as possible. The more you learn about the boarder human experience, the deeper the well of ideas you can draw from becomes. As to the more specific of your questions about what research or experiences I’ve found most important or difficult, I’m afraid I couldn’t tell you. I’m not dodging the question, I just can’t remember the individual acts, because for me writing has always been a process of running the entire sum of my knowledge and experience through the grinder. The Paradox novels, for example, pull ideas from everything: books I’ve read, jobs I’ve worked, that essay on binary gender I wrote for my one sociology class, a picture I saw on Deviant Art, video games, a role playing game my husband ran in middle school ten years before I even met him. All of these seemingly unrelated experiences and influences get mashed together as I write, and I couldn’t separate them out again if you paid me. People have actually asked me what degree or life experience they should get in order to become a genre writer before, and my answer to them has always been that writing genre stories makes you a genre writer, nothing else required. But if I had to recommend something, I’d say you’re best off studying whatever you find most interesting. Go wherever your passion leads, whether it’s in formal schooling, a challenging job, or just something you do for fun. Whatever you do, though, make sure you’re paying attention, because it’s these memorable, seemingly random notes of experience that you’re going be drawing from later as a writer. They’re the fuel that will keep your idea furnace blazing bright. All the other stuff—story structure, pacing, characterization, and so forth—is just a matter of practice. Or, at least, that’s how it’s been for me. Every writer works differently, so your mileage may vary. Elizabeth: You also commented in an interview that you feel your fantasy is informed by an SF sensibility. After reading Dr. James Gunn on writing science fiction, and the difference he sees between how SF and fantasy are approached differently, I realized that although the two genres feel different to me, I use much the same process in writing both. I want the deep logic in both to be similar–everything links together into one coherent system. What do you mean by having that SF sensibility in your fantasy? That leads to the impossible question of “Where do you see the difference between SF and fantasy?” and the closely related “Is there a line between worldbuilding everything but the “people” part of the story and worldbuilding the cultures the characters come from?” And if there is such a line, is that where the divide between science fiction and fantasy lives? Rachel: I don’t think anyone has ever drawn a line between Science Fiction and Fantasy that we can all agree on. Take Anne McCaffrey’s Pern books. Are they Fantasy or SF? On the one hand, you have dragons with mystical psychic bonds to their riders who can blink through space and time, on the other, humans are only on Pern because of space colonization and the Thread they ride dragons to burn is itself a space born spore. The easy way out of this is to just say “what does it matter? Pern is awesome!” but it does matter to readers. The F and SF parts of SFF attract different audiences with different expectations and tastes. That said, I absolutely agree with you that, from the perspective of a writer looking at her own books, the creation process for each is pretty much the same. In my own case, I’m a systems oriented, logical sort of person, so when I sat down to write a fantasy series, I took a logical approach to it. I built an internally consistent magic system and a world to contain it, and then I worked out from that framework to determine out how everything else in the story would function. When the time came to write Paradox, I built its universe the same way, only on a much grander scale. Both times, however, I figured out the why of reality first, and then used that to derive the how, who, and what. This is what I meant when I said I approached my Fantasy with a Science Fiction sensibility, because, as Dr. Gunn says, one of the fundamental elements of Science Fiction is the scientific idea that everything is ultimately knowable and explainable, even if we don’t understand it at the moment. For me, though, this is as true in a fantasy world with an active goddess figure who makes things happen on her whims as with a galaxy that formed by the accidents of nature. Everything is knowable, everything is explainable, everything happens for interlocking reasons, and discovering those reasons is often the whole point of the story. So at the worldbuilding, story crafting level, I don’t actually think there is a line between Science Fiction and Fantasy, at least not for me. Even when you start talking about characters, both Fantasy and Science Fiction favor larger than life heroes who change the world through significant personal action and sacrifice, be it exploring a new planet and ending up the unlikely champion of the indigenous population against your own corrupt galactic government or journeying to throw the One Ring into Mount Doom. Even the window dressings are somewhat interchangeable, because I’ve read Fantasy with complex machines and written Science Fiction with magic. There are short, lightning paced Fantasies and glacially slow SF epics with thousands of characters. Even the relative perception of time is no guarantee when the most famous Science Fiction story of all time took place long, long ago in a galaxy far, far away. Personally, I’m inclined to believe the only real, measurable line between Science Fiction and Fantasy is one of flavor and emphasis. Fantasy novels tend to emphasizes the fantastical elements—magic, monsters, fully developed secondary worlds, the sense of being in another place, etc.—while Science Fiction generally places its accent on the products of scientific achievement—gadgets, fast travel, galactic expansion, exploration in the vastness of space, and so forth. Otherwise, the two are so similar as to be almost interchangeable, as evidenced by how easily and often they get lumped together. Both genres tend to be deeply humanist, both reflect and comment on issues present in our own world, both provide a stage for the invention and exploration of alternate cultures, both are given to power fantasies, you get the idea. They’re both wonderful, delicious ice cream, and the only actual question here is which flavor do you prefer in your sundae. Elizabeth: Thinking ahead, do you imagine yourself delving into each of the various subgenres of our big playground, or do you think you’ll settle into some favorite pair (or quartet) of niches? So far you’ve done witty, rollicking fantasy and hard-edged action-packed SF…what other areas intrigue you and set the writer-vibes going? SF mysteries? Epic fantasy? Rachel: I freely admit that I’m an agent’s worst nightmare, because I write everything! In addition to my current roster of Fantasy and SF, I’ve finished the first in a near future Urban Fantasy series about dragons that I’ll be using as an experiment in self publishing this July. I also have an alt history mystery novel about magic in the Industrial Revolution set in Manchester complete with necromantic workhouses and a spell breaker detective that’s currently with my agent. And as if that weren’t enough, I’m also planning a darker military fantasy young adult book, another Paradox novel focusing on the secrets of the Sainted King, an epistolary series of shorts chronicling the tragically comedic and unavoidable fall of a Dark Lord called “Speeches to Orcs,” and about a thousand other things that I may or may not actually finish in 2014. So yeah, you could say I’m running all over our genre playground like that one weird kid who always eats waaaaay too much sugar. But then, what’s the point of writing fast if you don’t also write far and wide? Elizabeth: Thanks for being part of this–it’s been a lot of fun learning more about you and your work, and thinking about the questions you proposed. Rachel: Thank you for taking the time and for talking with me! Again, I can’t stress enough what an honor and a delight it’s been to get the chance to talk with you. (When I told my mother I was doing this, her response was “You’re interviewing Elizabeth Moon? Can I touch you? !”) Thank you again, and I can’t wait to get my hands on The Crown of Renewal later this year!! Rachel and Elizabeth will be back again soon, and next time the tables will be reversed! In the meantime, check out their novels and get ready for their upcoming releases!